The U.S. 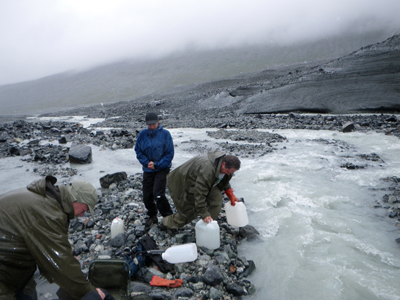 Carbon Cycle Science Program, in consultation with the Carbon Cycle Interagency Working Group (CCIWG), coordinates and facilitates activities relevant to carbon cycle science, climate and global change issues under the auspices of the U.S. Global Change Research Program (USGCRP) Interagency Committee or USGCRP Principals. 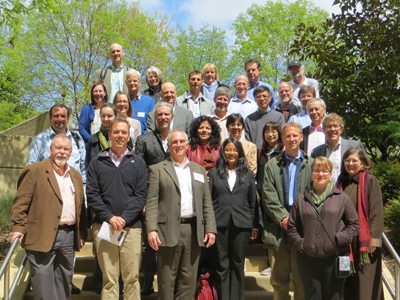 The CCIWG supports the peer-reviewed research of carbon cycle science across the federal government and is responsible for defining program goals, setting research priorities, and reviewing the progress of the research programs that contribute to carbon cycle science. 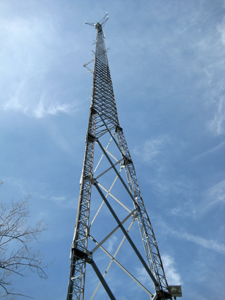 Thirteen federal agencies and departments coordinate and support our program activities. 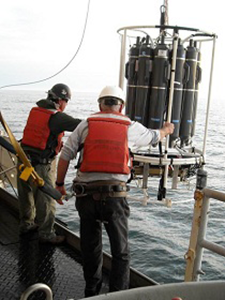 Researchers aboard NOAA ship Henry Bigelow collect water from a CTD rosette to analyze dissolved inorganic carbon and total alkalinity- two parameters which are important in understanding ocean acidification. (Photo credit: Jerry Prezioso.) 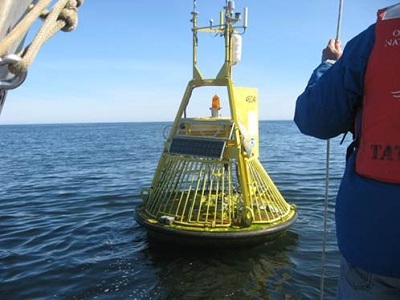 Funding: NOAA NEFSC, AOML, OAP. 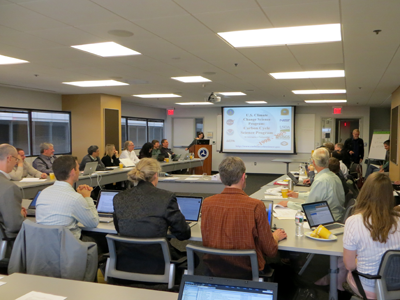 Fourth NACP All Investigators' Meeting Planning Committee, including CCIWG members, and staff from the U.S. Carbon Cycle Science Program Office and the NACP Office. 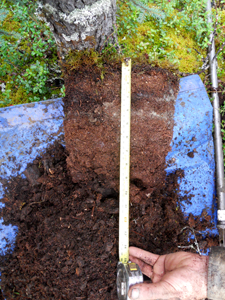 Quantifying the carbon content of fibric surface organic material located within the permafrost-rich, polygonal-tundra landscape of the Yukon-Kuskokwim Delta, Alaska. 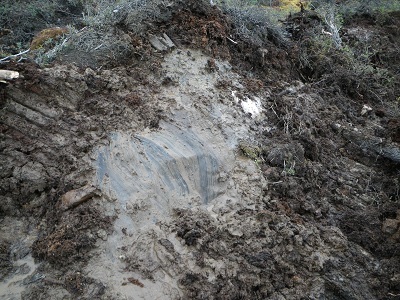 (Photo credit: Zhiliang Zhu, CCIWG member from USGS.) See related publications here. 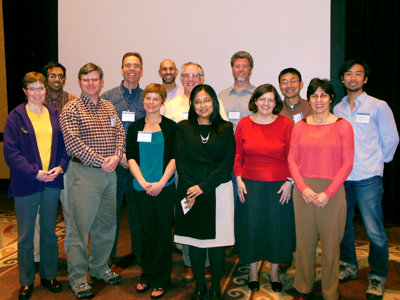 Members of the CCSSG, NACP SSG and CCIWG at the first joint meeting of both SSGs in 2013. All SSG meetings are held biannually in Washington, D.C.
CCIWG Member Diane Wickland presents the history of the U.S. Carbon Cycle Science Program during the first joint meeting of the CCSSG and NACP SSG. 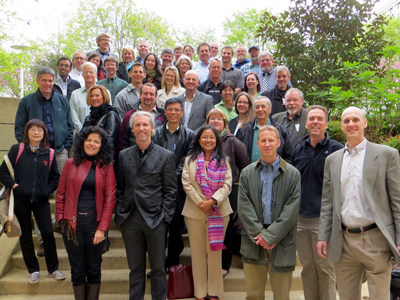 Members of the CCSSG and CCIWG at the 26th CCSSG meeting held in April 2013 in Washington, D.C. 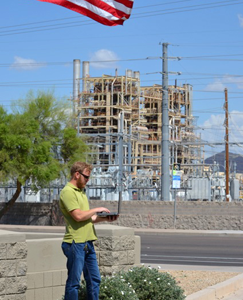 Scientist assessing carbon emissions from a power plant (Ventus Project made possible through NSF CAREER funding). (Photo credit: Kevin Gurney, ASU.) More info here. 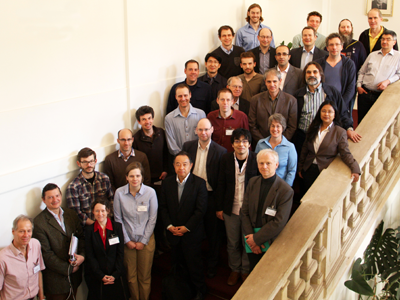 Participants of the April 2013 Global Carbon Project Scientific Steering Group Meeting and Negative Emissions Workshop organized in collaboration with IIASA in Austria. The U.S. 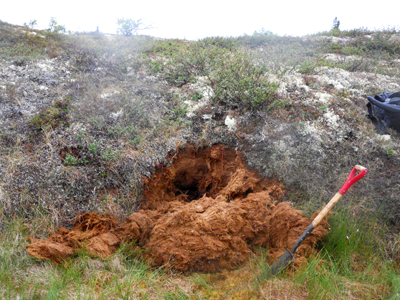 Carbon Cycle Science Program is an affiliated office of the Global Carbon Project. 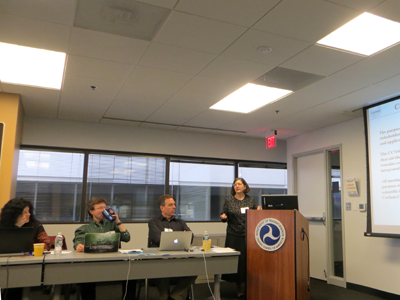 CCIWG addressing carbon cycle science community at a scientific steering group meeting, 2013, in Washington, D.C.